By Charlie Nadler. Donations go to Alex's Place / MV YMCA. Minimum donation is $2. Any amount above $2 is tax-deductible. 100% of project revenue goes to Alex's Place / MV YMCA. Charlie Nadler will be notified of your name and donation amount. Make sure this is accurate. We will email you a link to download the project. This is usually a 3-digit code on the back of your card (for AMEX, it's the 4-digit code on the front). By pressing "Donate now", you agree to the terms. Sorry, your browser is not modern enough to support this preview track. 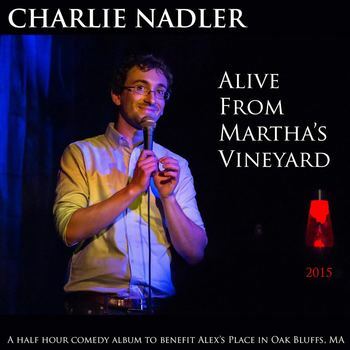 I’m happy to release my first half hour stand up comedy album, 'Alive From Martha's Vineyard'. I am DONATING ALL PROCEEDS to Alex's Place, my hometown venue where I recorded the album. It's a very special center named in legacy to Alexandra Gagnon that provides safe, enlightening, educational, and entertaining experiences for teens on Martha's Vineyard. I’d much rather give them the money, because they will make amazing use out of it, whereas I’d just waste it all on Uber and Seamless.